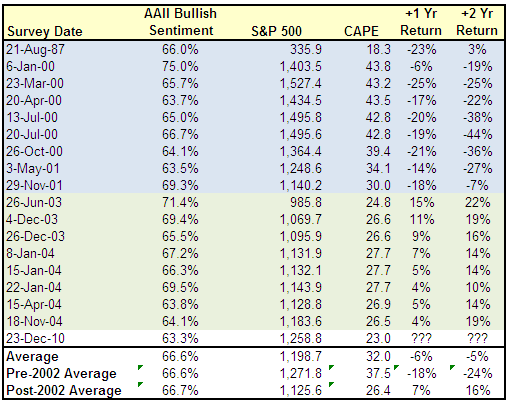 Bullish sentiment increased by a significant amount this week from already elevated levels. 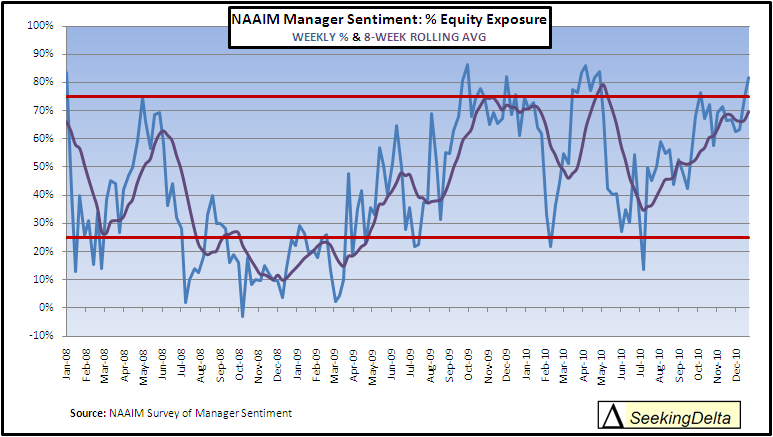 The NAAIM (active money managers) survey for this week showed a 7% increase in bullish sentiment while the AAII (individual investors) survey showed a 13% increase in bullish sentiment. 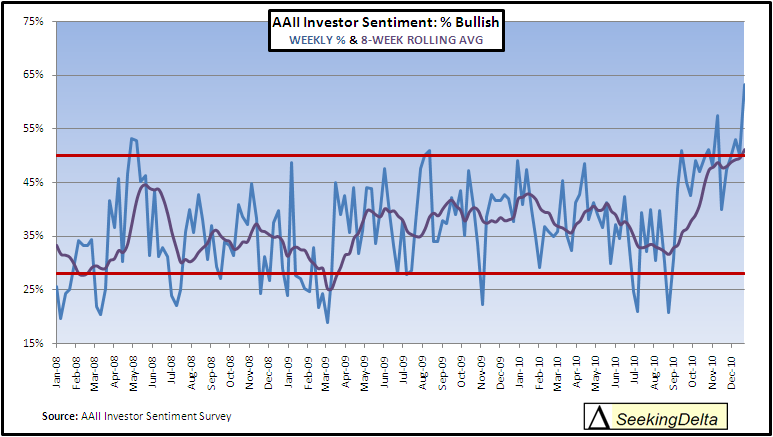 The AAII bullish sentiment reading of 63.3% is the highest since November of 2004 and is the 18th highest reading since the survey started in 1987. There have been 1,222 weekly surveys putting the 63.3% bullish reading in the top 1.5% of all readings. See the following table for detail on all 18 instances. As you can see, there are really two distinct experiences. Prior to 2002 when sentiment reached the current elevated levels the one and two year returns on the S&P 500 were very unfavorable with only the two year return from 1987 being positive. The opposite is true post-2002. Over one or two year time periods there are no examples of negative returns. One major distinction is the valuation level; CAPE during the pre-2002 examples averaged 37.5 while post-2002 occurrences averaged 26.4. The current CAPE of 23, while high by historical standards, is not at levels seen during the 2000 / 2001 peak. This week, active managers have, on average, a 82% allocation to equities. This is up from 75% last week. The median allocation rose to 92.5% while the top quartile of active managers have an allocation of 100% or greater to equities with the bottom quartile down to a 70% or less equity exposure. The eight week moving average is now at 70%. The NAAIM number measures current equity exposure (0% would be all cash, 100% fully invested). Additional detail can be found here. Individual investor’s bullish sentiment jumped to 63% this week from 50% in the prior week. Bearish sentiment declined to 16% from last week’s reading of 27%. The Bull-Bear spread is at 47%, well above the series average of 9%. The eight week moving average of bullish sentiment increased to 51%. Individual investor sentiment is more than two standard deviations from average with active manager sentiment one standard deviation from average. For analysis of the subsequent equity returns based on sentiment surveys please see the flowing links. AAII research here and NAAIM research here.